The largest city in Vietnam, Ho Chi Minh City has something for everyone. The city’s eight million residents still call it by its old name, Saigon, and for many, that name still carries with it the exotic charm of its long and fascinating history. Growing and stretching at a furious pace, the city is never still. The noise of construction on dozens of new office buildings and hotels mingles with the cries of street vendors and the honk of motorbikes and buses. Elegant restaurants, educational museums, ancient pagodas, and quiet botanical gardens are steps away from the hustle and bustle of everyday life of Ho Chi Minh City’s citizens. A fascinating conglomeration of cultures has been woven into the tapestry of this increasingly popular tourist destination. While the centuries-old history of Ho Chi Minh City is often murky due to lack of written records, we know that a once sleepy fishing village called Prei Nokor, located in a strategic spot along the Saigon River, slowly developed into a vastly important port of trade in the South China Sea. This trading port was later named Saigon after the Viets swept down from the north to conquer the kingdom of Champa in the 18th century. In 1861, the French military seized control of Saigon in retaliation for the mistreatment of French missionaries; and in 1862, the Treaty of Saigon named Saigon as the capital of French Cochinchina, which covered the southernmost one-third portion of what is modern-day Vietnam. The French influence during their nearly 100 years of rule shaped the form and character of the growing sea port, and modern visitors can see this influence in the architecture, street design, cuisine, fashion, and European-style hospitality. French rule was harsh to the native population, and the growing resentment and rebellion toward French colonialism produced a surge of support for Ho Chi Minh, the leader of the Viet Minh (the League for the Independence for Vietnam). Though Ho Chi Minh was Communist, this was a secondary concern for the native population, who desperately desired to be independent of all foreign governments. After WWII, Ho Chi Minh’s forces seized the northern city of Hanoi and set up the Democratic State of Vietnam in the north, with “Uncle Ho” as president. It was the clash between President Ho’s Communist North and the anti-Communist South and its ally, the United States, which sparked the terrible conflagration of the Vietnam War. Two years after American troops pulled out of Saigon in 1973, the Ho Chi Minh Campaign rolled into Saigon, and the city was quickly re-named after Ho Chi Minh. Later, the Vietnamese government embraced a market economy, which allowed the city’s thousands of imaginative and entrepreneurial leaders to begin creating remarkable wealth and prosperity. Today, visitors enjoy the benefits of this thriving economy while still being able to savor the historical remnants of Ho Chi Minh City’s manifold past. The best time to visit Ho Chi Minh City is during the dry season, which runs from December to April. Because it is located in a tropical climate, you can expect average year-round temperatures to be between 26 degrees C and 29 degrees C (79 degrees F to 84 degrees F). While the wet season from May to November produces many tropical storms, just plan some flexibility into your travel itinerary to accommodate any storms that arise. Any time of year is a great time to soak in the beautiful scenery and fascinating activities on offer in this engaging part of the world. War Remnants Museum: Many Western visitors to Ho Chi Minh City are generally knowledgeable about how the West was involved in the Vietnam War, but the War Remnants Museum will give you perspective on how it played out from a Vietnam citizen’s viewpoint. Be aware that the upper level of the museum displays sometimes very graphic images of victims of weapons such as Agent Orange and napalm. The museum also contains exhibits relating to the Indochina War (19 December 1946 – 1 August 1954), which was known as the Anti-French Resistance War to the people of Vietnam. Located in District 3. Ben Than Market: The ultimate in Ho Chi Minh City’s market culture, you can find just about anything in this centrally located, bustling daily market: produce, cuisine, clothing, jewelry, handbags, souvenirs, housewares, and much, much more. Bargaining is expected, so hone your haggling skills to command lower prices, and feel free to ignore the “fixed price” signs. NOTE: pickpockets operate in this area, so take special care to secure your valuable personal items against theft. Water Puppet Show: Puppeteers brought this unique and exceptionally enthralling entertainment to the south from the rice paddies of Northern Vietnam’s Red River Delta after the 11th century. Lacquered wooden puppets perform on a water stage, a waist-deep pool that hides the poles on which the puppets are manipulated. Puppeteers hide behind a bamboo screen while playing out tales of magic and myth that are so beloved in Vietnamese culture set to live, traditional music. While the plays are voiced entirely in Vietnamese, exaggerated puppet movements and helpful sound effects from the orchestra make plotlines easy to follow. Be sure to visit the Golden Dragon Water Puppetry Theater or the Villa Song Saigon (formerly Thao Dien Village) as part of your stay in HCM City. Jade Emperor Pagoda: Over 100 years old, the Taoist shrine is replete with the gods and heroes of Taoist beliefs along with Cantonese Buddhist inscriptions and carvings, though the pagoda is a place of worship meant for all faiths. The Jade Emperor himself (the supreme Taoism god) reigns swathed in clouds of incense in the Chamber of 10 Hells, with various gods and goddesses scattered throughout the intricately designed interior. In one of the courtyards, a shelter houses dozens of turtles, which represent longevity, fortune, and good luck in Asian culture. Admission is free, and the pagoda is open daily from 6am to 6pm. Though many French colonial buildings are being demolished to make room for modern buildings, there is a sense of freshness and innovation in HCM City’s current architectural plans. Still, the mainstays of the French colonial era have remained intact, and you can visit these beautiful remnants while also marveling at what’s new. Reunification Palace: Completed in 1966, Reunification Palace was built on the site of the original home of the French governor of Cochinchina in 1868. The residence was gradually expanded to become Norodom Palace before becoming the home of the first South Vietnamese president after Vietnam gained independence from France, Ngo Dinh Diem. After surviving an assassination attempt by his own air force, which demolished the palace with bombs, President Ngo built another one called Independence Palace, but he was killed by his troops three years before its completion. After Saigon fell to the North Vietnamese, the palace was renamed Reunification Palace, and visitors can enjoy its cheery, open 1960s-era architecture and furnishings, which have been left in place since the palace was abandoned. Daily tours can accommodate English and French speakers. Bitexco Financial Tower – Saigon Skydeck: A 68-story marvel, this airy tower graces the HCM City skyline as the 124th tallest tower in the world. Floors of the building house offices, shops, restaurants, and a helipad, but the biggest draw is the Saigon Skydeck, an observation deck that provides 360 degree views of HCM City and the Saigon River below. Designed by American architect Carlos Zapata, the award-winning financial tower is on CNNGo’s list of 20 of the world’s most iconic skyscrapers. Shop, eat, or enjoy art shows as well as take in the amazing views and the city’s other landmarks at the tower’s location on 36 Ho Tung Mau Street in District 1. The sky deck is open daily from 9:30am to 9:30pm. Notre Dame Cathedral: Started by the French in 1877 and not completed for many decades, Notre Dame Cathedral in the heart of Ho Chi Minh City served as the Catholic office headquarters in Cochinchine as well as a testament to the Vietnamese of France’s might and power. The cathedral was anointed as a basilica by the Vatican in 1962, which officially renamed it the Basilica of Our Lady of the Immaculate Conception. Unlike more elaborate cathedrals in other countries, the Notre Dame Cathedral in HCM City has a fairly simple interior, a place of peace and serenity amongst the noise and chaos of life in downtown HCM City. Sunday masses are conducted in both English and Vietnamese (the public is welcome to attend), and the cathedral is open to the public daily for tours. The front doors are open for Sunday masses, but on weekdays, use the side door. Food in Vietnam culture really is about love: the love of the ingredients, the process of cooking, and the act of eating. When you visit Ho Chi Minh City, you must make it a point to sample the cuisine in order to truly begin to understand the people and the culture. From street vendors to the most elegant five-star restaurants, HCM City offers a sampling of regional cuisine from all over the entire country—the North, the Central area, and, of course, the South. Street Food & Local Stalls: From pho to ban tam bi, you can find almost any Vietnamese dish served on the street. Grazing along among the stalls and tiny shops is one of the transcendental experiences of HCM City. Choose vendors and stalls where there are lines, as this means that the ingredients are fresher and replaced often, lessening any chances of food poisoning—which is very rare if you take a few simple precautions (read Jodi Ettenberg’s excellent guide on safely eating street food at Legal Nomads blog). Whatever you do, don’t refuse to eat street food! You’ll be missing out on some of the best eats you’ve ever had, the kind of food you will lovingly describe to any friend or stranger who will listen at any party you attend in the future. Cyclo Resto: This is where the locals eat, so you are guaranteed a delicious, authentic meal for a great price. Cyclo Resto’s set menu takes the guesswork out of ordering, and the staff will helpfully explain each dish. Located down a little alley, the time you spend searching it out will only whet your appetite for the fantastic meal you are about to enjoy. XO Tours: A food tour from a local is one of the best ways to both see and taste what a city has to offer. XO Tours offers family-friendly motorbike tours, and the friendly, knowledgeable female guides will take you to parts of the city you aren’t likely to see otherwise—all while sampling dishes that keep your taste buds tingling. 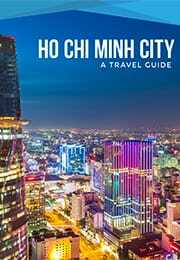 XO Tour guides deliver all kinds of interesting information about the history and way of life in HCM City. Many speak English very well. One of the biggest advantages of having a tour guide is that you get a wealth of information that the guidebooks can’t deliver. Adventure tours of the city and the surrounding area take all of the stress out of freely exploring must-see sights. Book a tour, show up at the appointed time, and take it all in! Cu Chi Tunnels: Part of the Vietnam War Memorial Park, the Cu Chi tunnels were created by the Communist Viet Cong (VC) during the Vietnam War in order to escape U.S. and South Vietnam bombs and searches. Located under the Cu Chi district in northwest HCM City, the Cu Chi tunnels are part of a larger network of tunnels the VC used to link with other bases that stretched from Saigon all the way to the Cambodian border. Many civilians also lived in the tunnels. Today, visitors are allowed to crawl through some of the safer tunnel areas, sample food that a typical VC soldier would have eaten, and shoot an AK-47 on a shooting range. Mekong Delta Private Day Tour: The Mekong Delta produces an astonishing 1/3 of Vietnam’s annual food crop, including rice, coconut palms, sugar cane, and tropical fruits. All of this lush agriculture means that visitors can revel in the diverse scenery and greenery, visiting farms, food stalls, and restaurants that specialize in cuisine derived from the freshest fruits, vegetables, and seafood available. Quiet rides down the river in a longtail boat spotting exotic flora and fauna are also not to be missed. Book a tour with Viator for an incredibly reasonable price and spend a day exploring the beautiful Mekong Delta. Vietnam Vespa Adventures: Saigon at night from the back of a Vespa scooter is a magical place. When you can sit in the open air behind a skilled driver, you’ll see sights and hear sounds unavailable in an air-conditioned car. Guides show you both the popular and hidden parts of HCM City as well as introduce you to special restaurants and hidden-away eateries—all the more fun when you know that the food and drink are included in the price of the tour. Ho Chi Minh City is a wonderland of sights, smells, tastes, and experiences. No matter how long you stay, you’ll never be able to see it all, but the fun is in the attempt to see and experience as much as you can. Busy, vibrant, growing, and a mix of old-world charm and modern industry, you’ll never regret adding HCM City to your Vietnam itinerary.